In college one of my friends belonged to an anime club. At the time I just couldn't understand the appeal of this animation style. The characters with huge eyes and dubbed voices seemed rather strange to me. Now, 15+ years later anime and manga/graphic novels are mainstream, and I've grown to appreciate the artwork and storytelling (mostly). Anime adaptions of classic literature are not unheard of. 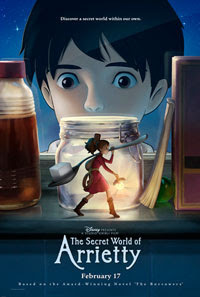 I'm rather excited for Disney's movie The Secret World of Arrietty to open in U.S. theaters on February 17th. This Japanese animated fantasy film is based on Mary Norton's classic story The Borrowers. From the look of the previews, the classic story is updated, and "the Borrowers" live in a modern, suburban setting. The film was originally released in Japan in 2010 and did well in the box office. I'm interested to see how it fairs with U.S. audiences. Due to the animation style, I imagine it will appeal to a broader age range than the typical Disney animated movie. Hopefully the release will also ignite a renewed interest in Mary Norton's original book! I'm reading The Borrowers aloud to my daughter this month. If you own a Kindle, you can download a copy of The Borrowers by Mary Norton for only $1.59 on Amazon.com. A number of well-known celebrities provide the voices of the characters in the U.S. movie release including Will Arnett, Amy Poehler, Bridgit Mendler and Carol Burnett. I'm really curious about the movie too because I LOVED the books as a kid, and am worried they're going to mess them up. I'm not so sure I'd like to see this done in anime - but maybe it will ignite the childrens' interest in the books. I loved The Borrowers too. I hope the movie is good. I feel like it could go either way. I love your description of anime! Thanks for the tip about the book on Kindle. We saw this last year and really loved it. Can definitely recommend it! I am not a fan of anime except in special cases. This is one of them. We loved this (it came out here in 2010), and Miyazaki is a master schmaltz-less sweet. The eyes aren't too big either. Hope there will be an English DVD soon!